1 larger hook (to connect to hook on ceiling, and other end of hook to put the 4 strands of chains on. I had the guy at the home improvement store cut the chains 14″ long. (You can adjust this to fit the height you want need.) Lengths will be different, it depends on how high your ceiling is where it’s being attached to. I spray painted the wreath, wire chain, hooks… all white. I then started wrapping the lights on the outside wire first as seen below. All you need to do is start wrapping it around. To get it to stay, I pulled the icicle part down between wire sections.The Chandelier is going to be hung with a bit larger hook. Notice the silver hook above bottom right side. I was connecting to a outdoor extension cord, so I left the length of the chain plus another 6 or 7 inches to reach the extension cord. The pic shows green wire, but I painted it white after pic. This is how it looks with chains and up top! I then added some pretty sparkly silver beads. Shine so pretty even during the during the day! There you go….sounds complicated…but it isn’t, really!!!! I love how this looks in my pergola! 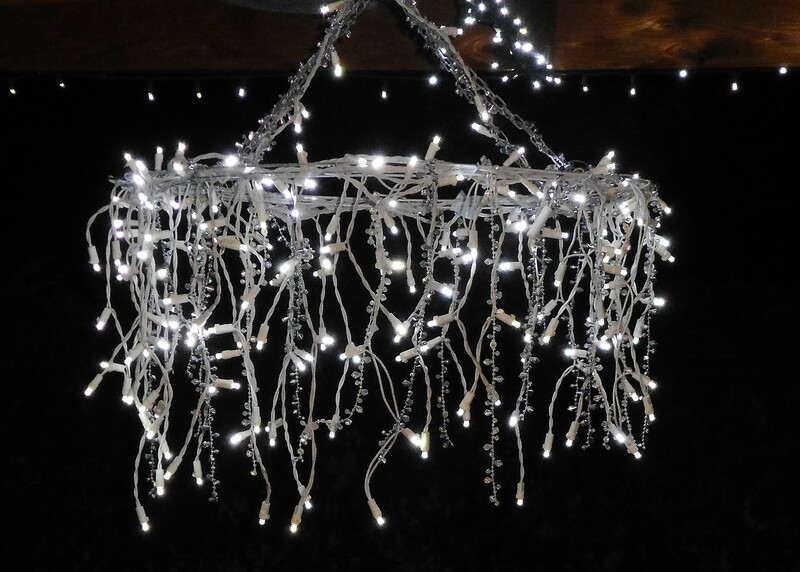 So fun and easy to make….hope you try…it looks so good outside…beautiful at night!!! this little guy (hummingbird) sits atop the chandelier all day swinging in the breeze! I hope I inspired you to make this for your home! Thank you for looking! That little guy was so protective of ‘his’ backyard! I had 4-5 hummer feeders in different areas in the backyard, and that little guy would chase other hummers out….You would think he would be exhausted flying all the others out all day long!hahaa He would sit on that chandelier all day. What was adorable was the chandelier would sway a little in a strong breeze, he would stay on! I think he made it his own personal swing! Aww…that’s adorable. A beautiful lil protective companion. It is soooo pretty at night too. So easy to create too! I had caught a glimpse of this in another post the other day, and forgot to ask you about it. It’s pretty cool! You should definitely be proud! The whole patio looks beautiful! Thank you so much. I need more confidence, it really holds me back. you too…don’t you hate that? Ugh! Thank you so much Robin. I am proud of myself on this one for sure! It’s wonderful when your project works out as good as it was in your head! That doesn’t happen all the time hahaha…plenty of project fails! Live and learn! Well hello there girl! Are you having a great summer? I am. It’s been pretty busy. How are you? Having a good summer? So what have you been working on? My summer is good, quiet. My brace comes off in just a couple more weeks! Yay! Then I am heading to see my granddaughter! Ugh…3 more weeks to go with the brace. But…I’m learning to live with it! hahaa. I don’t want to see my granddaughter like this though. I couldn’t hold her, lift and hug, or even hold hands with her and play. It’s best I wait so I don’t harm myself. Oh you betcha I will!! 17th Sept!!! I am moving so I have been trying to pack up a house….1 or 2 boxes a day! So many ‘rules’ for recovery. But I am in great spirits and happy! Thank you so much honey, I’m glad your shop is busy! Gotta check out your signs!! You are so good at making something your own – this is just so eye catching and artistic and your directions are excellent! Thank you so much for your wonderful comment. It’s really is so easy to create. The lights just fit onto it so easily. Are you going to try it? Absolutely – just love it! Ohh, thank you, thank you, thank you! Kelly this is a fabulous idea! You’re always so creative but I think this is just about my favorite creation from you. It’s an original….one of my easiest, prettiest ideas. Thank you so much Carol!